The 3Com Switch 4200G is an affordable, managed entry-level Gigabit switch, perfect for cost-conscious medium-sized businesses wanting a fast, efficient network upgrade. Layer 2 switching along with Layer 3 static routing make the Switch 4200G ideal for wiring closet and workgroup connectivity.It delivers quad-speed performance - 10/100/1000 and 10-Gigabit Ethernet. The Switch 4200G features eight auto-negotiating 10/100/1000 ports configured as auto-MDI/MDIX, four dual-personality 10/100/1000 or SFP Gigabit ports, and one 10-Gigabit slot. Up to 32 devices can be clustered together for easy administration.QoS and traffic management features help ensure essential applications get the appropriate priority for efficient utilization of network resources. 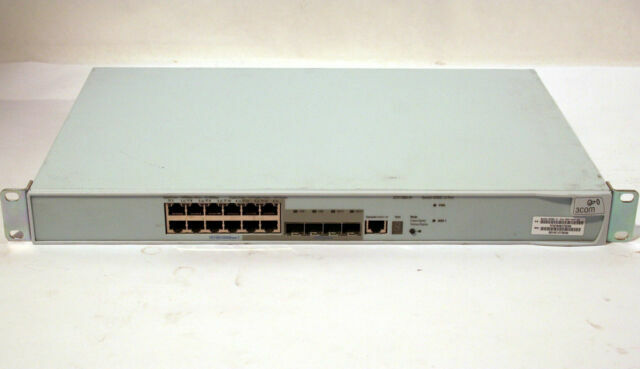 Furthermore, this switch has enterprise-class security features including IEEE 802.1X network login, SSH/SSL encrypted device log-in, and Access Control Lists.